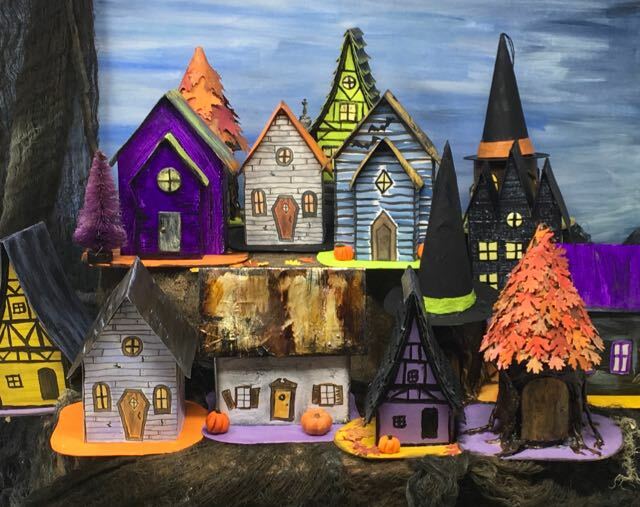 The growing Halloween village with two versions of Halloween house No. 5 front row in the top tier of paper houses. It kind of looks like a class photo, doesn’t it? I would be one of the ones tucked directly behind everyone else. 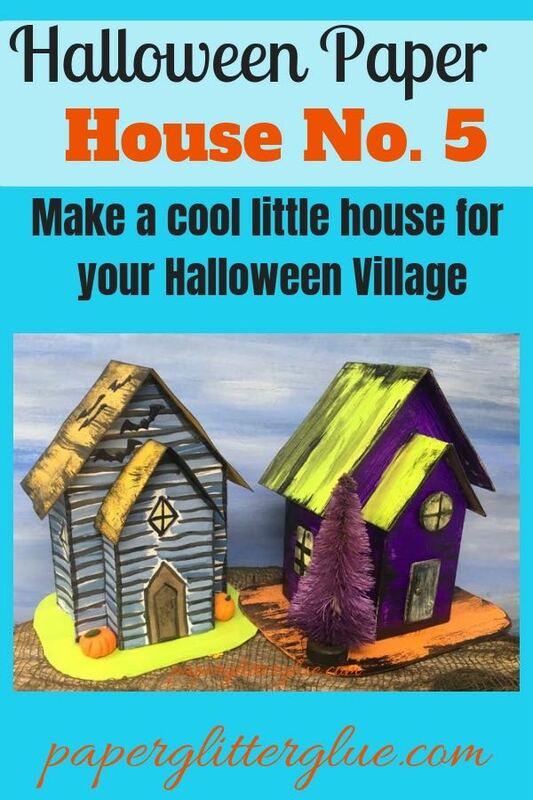 The Halloween Village of little paper houses continues to grow with the addition of Halloween House No. 5 with its front portico. 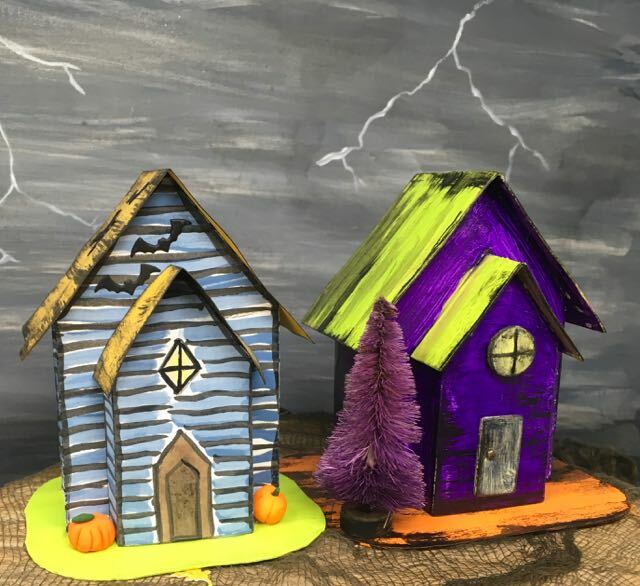 Fortunately, the neighbors like having more people move in for sharing recipes, tools and brooms, making potions, child-rearing advice, Halloween decor, stuff like that. So we have arrived at Halloween House No. 5 – another relatively simple house, but with a front addition. The little portico in the front just provides an extra dimension to the house. I think I said on another post that the little houses will gradually get a little more complex as we go along. I think I wrote at the end of yesterday’s post that I was going to write about a house called Triple Gable Gothic. That house will be in a couple of days, but it looks really good so far. Glue the roof to the portico first, then the roof to the house. Please note: I am unable to save it as a DXF file at this time, but I will be working on it. And I still haven’t figured out compound paths to make a separate layer for the scored lines. I probably won’t get that done until after Halloween. I am so sorry about that because I really have been trying to learn. Just getting the outline part straight (make sure the house components are not grouped, select each piece separately, and then Union) has been a brain workout for me. Trace your pattern onto your cardboard. This pattern you see is for Halloween House no. 4. Even though Halloween house no. 5 is simple, I think it needs to be made out of cardboard. Generally, I use a thin cardboard about the the thickness of poster board because that is what I have and it makes a very sturdy house. This is why I don’t think you should use cardstock for this house. The walls are too bendy. 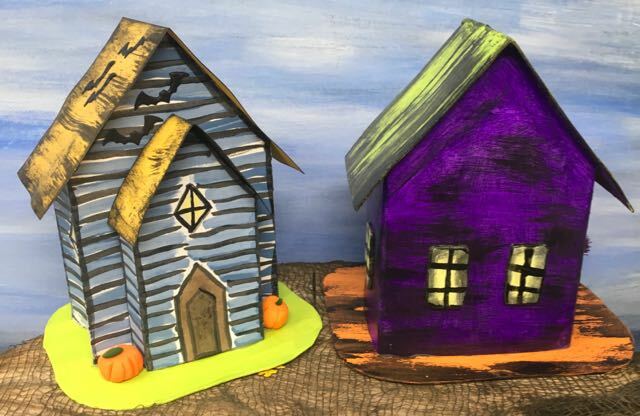 The purple house is made out of cardboard, the blue clapboard painted house is made of cardstock. 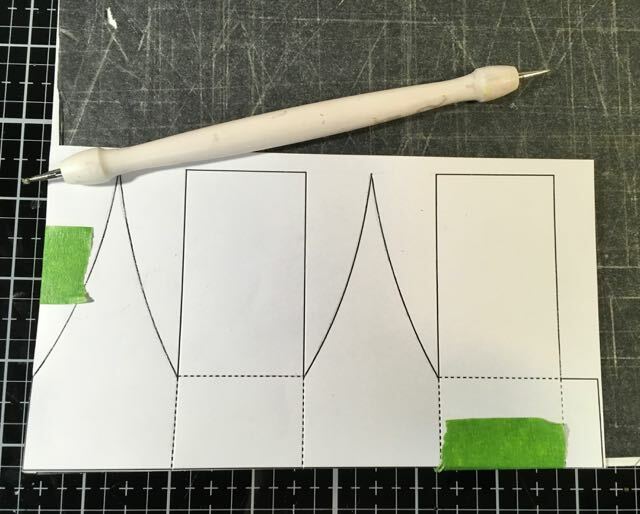 I used tracing paper to transfer my pattern to the cardboard. But you can trace the pattern with a pen or a dull pencil to leave lines on your cardboard which you can cut out and score. Or if you have a Cricut you can cut it out without even going through this step. I look forward to the day when I am able to do that. But when you are using cardboard, paint your cardboard with gesso so the paint layer will stick well. Poster board and the cardboard often have a slick coating that needs gesso for the paint to adhere. Then choose your paint color. 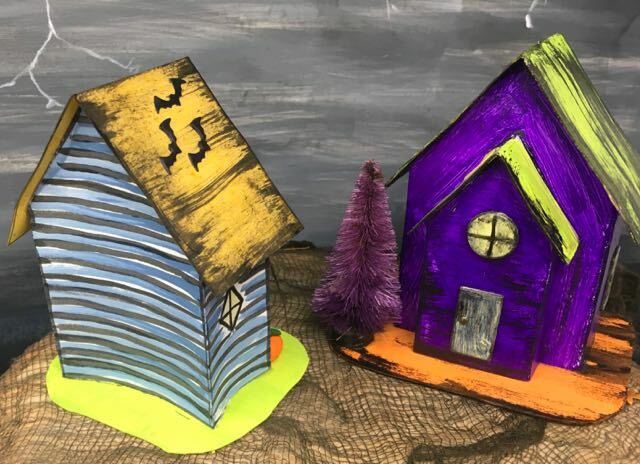 I chose a different colors for the 2 houses I made with this pattern. 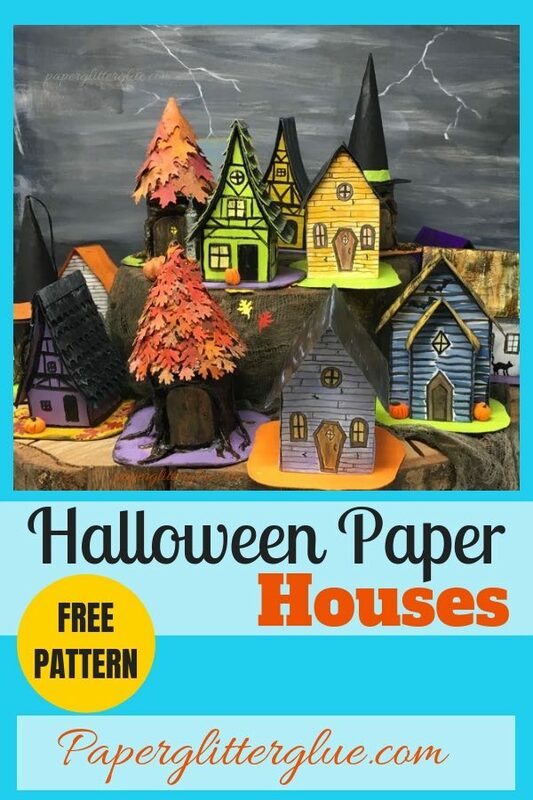 Halloween paper house pattern No. 5. Oh, this is the back of the purple house that’s why you don’t see the portico. I didn’t forget it. After the house structure is firmly glued together then you can center the portico and glue it on with the glue tabs folded in the back. Here the only trick is to glue the sides so that they don’t bend inward or outward too much. Sometimes it’s a little hard to keep the angles square. Glue the roof on the portico first because it’s easier to hold it in place if the main roof isn’t on yet. Paint your roof whatever color you like. I’ve been using the Tim Holtz Distress Paints which work so well together. If you are going to add shingles, paint the under layer so you won’t see raw cardboard on the edges or if you miss a spot with the shingles. You can add shingles now or after it is adhered to the body of the house. Normally, I glue shingles on after the roof is already glued onto the house because sometimes there is an angle you have to compensate for. The Halloween house pattern no. 5 is pretty easy to make. Finally, the funnest step – decorating. 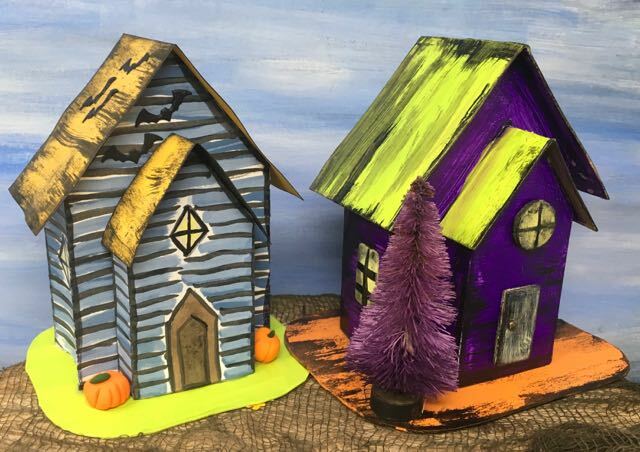 I use all sorts of embellishments on my little houses. For Halloween House No. 5, I kept them kind of simple just the like previous houses, but you can go bat crazy if you want. I did include several bats on the roof of the one of the houses. Thank you for visiting me on the 5th day of the 13 days of Halloween. See you tomorrow.